A deadly stampede broke out after Ethiopian police reportedly fired tear gas to break up an ethnic Oroma protest with “several” people killed south of the capital, Addis Ababa. There were conflicting death toll reports following the stampede on Sunday. A government statement said several had been killed in the town of Bishoftu. An AFP photographer at the scene said he saw 15-20 unmoving bodies, some of whom were clearly dead. Thousands of people gathered for the annual Irreecha festival in Bishoftu, about 40km south of the capital. According to New York-based Human Rights Watch, at least 500 people have been killed by security forces since the demonstrations began in November. 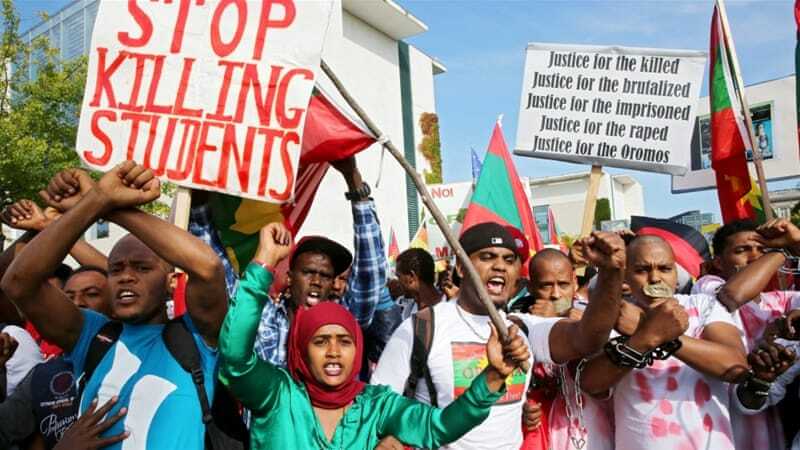 Though protests started among the Oromo – Ethiopia’s biggest ethnic group – they later spread to the Amhara, the second-most largest in the country. The government has denied that violence from the security forces is systemic, though a spokesman told Al Jazeera that police officers “sometimes take the law into their own hands”, pledging an independent investigation.